What lengths would you go through just to preserve your own unflinching legacy? Would you fight off a hoard of grotesque maniacs? Would you hire a gang of costumed heroes? 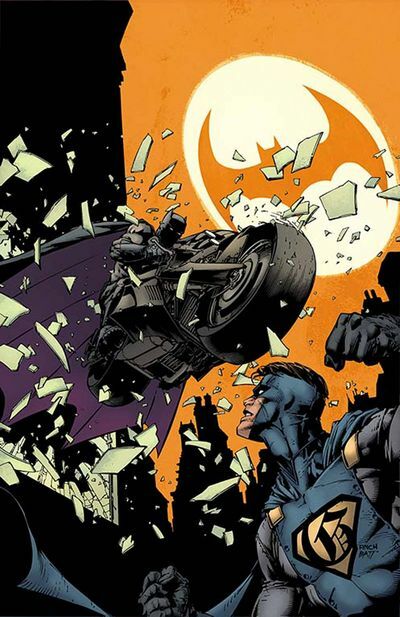 Better yet, would you sit down, have a nice drink, and read the following comic book created by Tom King, David Finch, and published by DC Comics? It's August, 2016, and it's time for the Batman double-review. TO QUOTE Miranda Lambert: 'I think I find new idols every day. Someone that says something really inspiring, is successful, has character'. Now there's nothing unusual about Batman saving a young family from being attacked on the city streets, is there my friend? As most of us know Batman saving someone is nigh on an every day occurrence. The thing is, years back he saves one family in particular, a family called the Clover's, and the young boy in this family, named Hank Clover, becomes so inspired by this event, that both he and his sister Claire decide to dedicate their lives, following in their saviors footsteps. However, during their time fighting the good fight happenstance seems to take them overseas, and while there, they strangely call home and ask their parents for some financial assistance (curious?). Obviously, they abide by their children's wishes, and upon their return, surprise-surprise, two other people pop up at the same time: Gotham and Gotham Girl. Yep. That's right, dear reader. 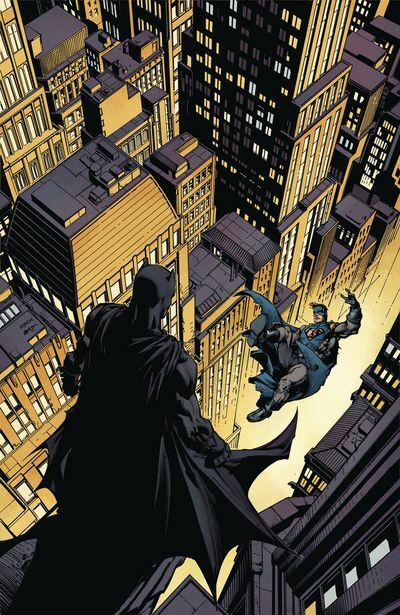 The lead in to episode three is basically an origin story told by Hank and Claire's father, Hendry Clover, directed towards Agent Matches Malone -- AKA Batman - AKA Bruce Wayne -- as he's questioning him at the start of the book. Then, once that's over and done with, afterwards we're presented with another scene were Batman teams-up with the three G's (Editors Note: Can you think of a better abbreviation? ), who are currently trying to save people on a bridge that's about to collapse. Now, unlike the first part of issue three -- which is generally narrated by Hendry -- the second part is narrated by the villain of the piece -- Doctor Hugo Strange -- who as we find out, is the mastermind behind everything that's been going on during this 'I am Gotham' story-arc. Him, the Suicide Squad, plus another villain I really-really like, The Psycho Pirate, AKA Roger Hayden. From my point of view his villainous addition, compiled with the fact that Batman is now being aided by two powerful superheroes, goes to show that King and Finch are really trying to take our heroes into uncharted territory. And to prove this point, by issue four -- yes, where here now -- we discover that Amanda Waller (looking surprisingly like Viola Davis) has turned into the Cluemaster. No. I'm not kidding. Between issues 3 and 4, Gotham -- the man, not the city -- gets mind-shagged by the Psycho Pirate, causing him to kill 24 soldiers in the process! That's 24, which in alphanumerical terms equals the letter 'X', as in 'Task Force X', a covert action team Batman deduces is behind this mess, once he has a talk with Thomas. You got that? Good. Once this detail is revealed, Batman, in that mysterious way of his, elaborates on his deduction to Waller over in her office. In turn, Waller quickly turns the tables on Batman, and justifies to him that he is the reason for the governments infiltration of Gotham -- the city, not the man -- before she offers him a proposition he can't refuse. 'Work with us to stop Gotham, Batman, or else I will remove your cameo in our new film'. OK. So that last bit was a lie. Sorry about that. I couldn't resist. But the rest of it was right on the money. Gotham does kill a team of soldiers. The dead team of soldiers lead's Batman to the Wall. And the Wall manages to coerce Batman into confronting Gotham at the end of the book -- twice no less. Now I don't really want to tell you too much more or else I might spoil the ending. But that said; however, let's just say Bat's does have a spat with his new buddy, and this leads to a cliff-hanger that felt slightly tagged on. No offence to Tom's writing of course. Overall it was pretty good. It's just that there were a couple of instances in episode 4 which kind of felt out of place, so to speak. Such as Batman piecing together that the Suicide Squad was behind this mess due to the number of dead soldiers Gotham killed! I mean, would the Wall set this up deliberately? I can't see it myself. She's no Riddler or Cluemaster. 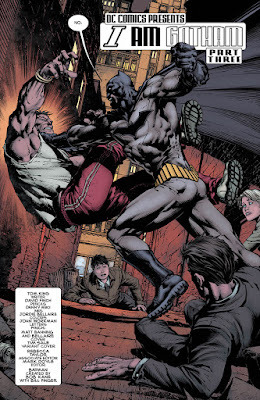 Or for that matter, Batman allowing Gotham to break a soldier's neck without him even trying to stop him, or how about, Hugo Strange duping Amanda into allowing him to control and take over the Psycho Pirate. No-no-no. To me, this doesn't seem to be in character for either Bat's or the Wall. Art-wise, on the other hand, I couldn't find any fault with David's amazing pencil work. Not only does he allow Batman to show a lot of expression behind his mask -- more than usual methinks -- but on top of that, his action scenes are very well choreographed and I love the muted tones which complemented his panoramic visuals. A so-so story. It's not bad. But it's not brilliant either. Despite it sounding like a totally irrelevant comparison and nothing to do with these two issues, to me, issue three was about someone wanting to follow in their idols footsteps. 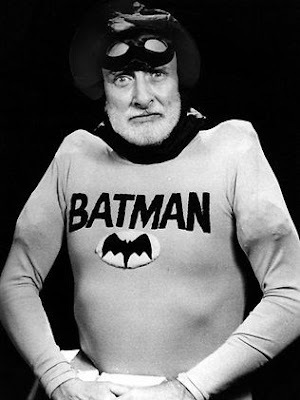 Now my idol is none other than the Godfather of British Comedy and satire in general, Spike Milligan. You're dead now, Spike, dead as someone who wanted to be crushed by a falling elephant. So in your good name, I now compare thy comic book to your goonish legacy. Without you, there would have been no Monty Python, Eddie Izzard, and well me, most probably. Not this nutty version of me anyway. 'I can save my love for you'. 'I can sing in Flemish'. 'I can save the new Suicide Squad movie'. 'I can write a better review than this sh*t'. 'I can save the lint in my bellybutton'. 'I can kill it before it hurts anybody else'. 'I can save coupons for me to use on ebay'. 'I'm very good at dry cleaning'.